The library Parks are part of former mayor, Sergio Fajardo’s strategy: “Medellin the most educated”. The interventions are specifically called Library Parks because of their aim to achieving an urban transformation (mostly through the creation of public spaces). The development plan 2004-2007 states its interest in “strengthening the libraries as a integral centers for development and social culture” (“el fortalecimiento de las bibliotecas como centros integrales de desarrollo y cultura social”). – Proximity to public transportation of high or medium capacity. – Proximity to environmental systems. The Medellin River traverses the valley from North to South. Connected to this river, are various creeks that run down the mountains (E-W). The POT (zoning plan) has considered these streams as strategic elements for the creation of public space and a better quality of life in the city. As such, a series of linear parks bordering the creaks, have been planed and constructed, whenever possible connecting to the library parks. – The strengthening of favelas as new centralities with the implementation the education, cultural and sports programs and amenities. 1-Parque Bilbioteca Sacerdote José Luis Arroyave Restrepo in San Javier. Inauguration December 2006, Architect: Javier Vera Londoño. 3-Parque Biblioteca Tomas Carrasquilla in Quintana, Inauguration March 2007. Architect: Ricardo La Rotta Caballero. In addition, there are 2 other currently under construction under the new mayor Salazar: San Cristobal and 12 de Octubre. With the help of the following photographic series (the attached PDF at the bottom of the post), I will show selection of materials and construction details as well as attempt to describe 4 of the constructed libraries and there relationship to their surrounding (I was not able to visit the Library Park Quintana). 1-The library park San Javier is located next to the San Javier metro stop, as well as the beginning of the San Cristobal Metro Cable (which to the public housing in Aurora and Pajarito). 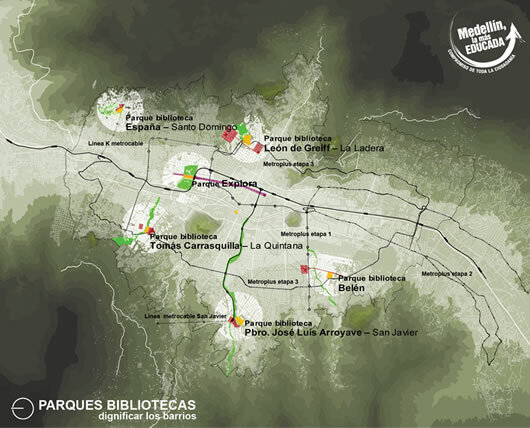 2- The library park la Ladera aims to connect parts of the city which had been left disarticulated from its surrounding urban fabric due to the presence of vast vacant areas. The design integrates some existing basketball and soccer courts located on the top of the hill. There are 3 main volumes, which open up to the city view (North West- because of this orientation, some of the spaces near the large windows facing NW become completely unusable during the hours of the afternoon- a shame in my opinion….). Since the volumes are nestled into the landscape, the taking advantage of slope, the rooftop of the library is completely inhabitable, thus allowing for some interesting overlooks and amphitheaters. 4- The Library Spain sits in the middle of Santo Domingo Savio in the Comuna 1. The program is divided into 3 volumes located at the top of the mountains located Northeast of the city. This is one of the most iconic designs, a reason for which it is easily described as “diamond in the rough”. It is important to note that this is the fist library part of a PUI (proyecto urbano integral, which translates to an integral urban project). Also part of the North East PUI are the Parque Mirador, el Paseo de la Calle 106 y el Parque Candelaria donde se encuentra Centro de Desarrollo Empresarial CEDEZO, en el camino hacia la Estación de retorno del Metrocable. àRegarding the PUI, I will get into a little more detail in my next post, using the Noriental (NE) PUI as an example. 5- Contrary to the other library designs, which were competitions, this design was donated by a Japanese architect. The execution was done in conjunction with architects of the EDU. The main distribution consists of 3 main courtyards – a concrete courtyard, a water courtyard and a green courtyard (grass). The library is located next to a hospital and takes the place of what used to be a prison. Surrounding the library, are middle class neighborhoods, although, on the map, we can note the presence of informal settlements. Still under “Medellin the most educated” are the Schools of Quality. These interventions follow very similar strategies to the Library Parks, thus not only focusing on the school itself, but also on the creation of public space… Following is an example of Santo Domingo Savio’s School of Quality (located near the Metro Cable station and the Library Park España).